Are Meghan Markle and Kate Middleton Friends? How Does Kate Feel About Meghan? Meghan Markle officially joined the royal family when she wed Prince Harry in May, but even before they tied the knot, there was much speculation over how the former Suits star would fit in with her new relatives — especially her new sister-in-law, Kate Middleton. Not long after Meghan and Harry's engagement was announced in November 2017, all eyes were on the newly-minted "royal Fab Four" as they stepped out together for Christmas church service in Sandringham. And in March 2018 when the quartet attended a panel for the Royal Foundation, Meghan and Kate seemed to get on swimmingly during their joint outing; at the same time, it was reported that the two had shared some sweet private moments as well. According to Us Weekly, Meghan liked to "pop in" to visit Kate, and would often bring "delicious treats" for the then-pregnant duchess and give "a healthy eating tip she's read or maternity style pointers." In turn, Kate would "share tales of her entry into 'The Firm,'" which is the name the royals have given their own family. They'd drink tea and gossip, and Kate offered up "advice about adapting to the royal family." The publication also reported that Kate told Meghan "that if she ever needed anything, she shouldn't hesitate to get in touch." Aww! 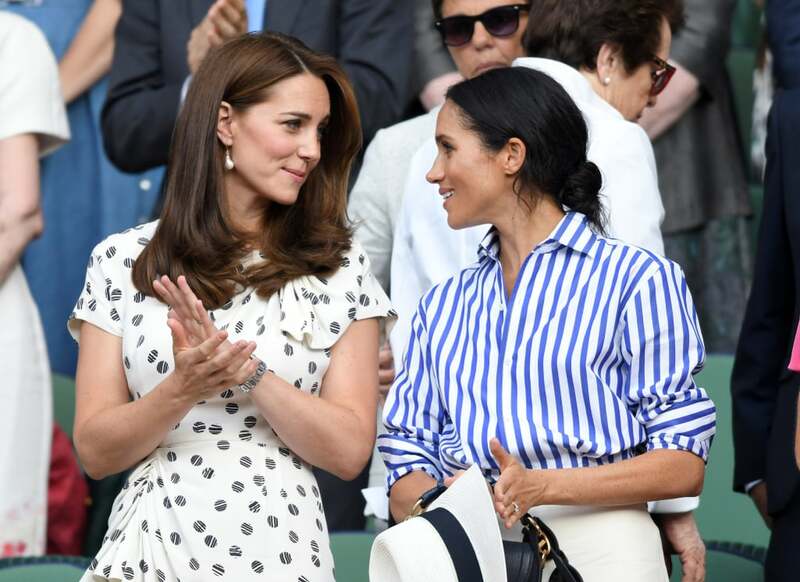 Fast forward several months, and we've gotten to see Meghan and Kate out and about together on a handful of occasions, including official events like Trooping the Colour and RAF celebrations, as well as more laid-back outings like watching Serena Williams's Wimbledon match. And of course, Kate was there to see Meghan walk down the aisle with Harry, and both duchesses seemed in high spirits as they chatted in their seats at Princess Eugenie's wedding. 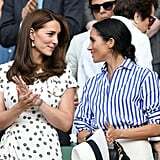 But because this is 2018 and I can't have any joy in my life, Kate and Meghan's blossoming friendship became the subject of rumors that the two are fighting. It's almost as if these two smart, poised, beautiful women have to be arguing, just because they're women, right? They can't just be two smart, poised, beautiful women with different personalities and roles who might not be on the same page about things all the time. Not only am I personally tired of hearing the rift rumors, but I'd also like to point out the proof that Meghan and Kate are friends — maybe not best friends, because how many people are best friends with their sisters-in-law? — and ask that we shift our focus to their accomplishments (OK, and their outfits) instead. 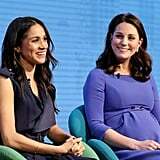 Ahead, see what Meghan and Kate have said about each other, and why I think we should put this latest batch of royal rumors to rest.